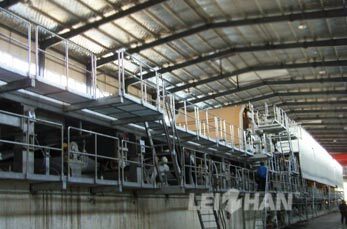 Leizhan is dedicated to provide tailored paper making machinery and paper production solutions for paper mill. Leizhan’s engineers and experts offer customers access to paper making process know-how and technology. The target of Leizhan is to reduce operating cost and improve performance of paper manufacturing system. The machine consists of headbox, fourdrinier wire forming, press section, drying section, gas hood section, sizing machine, calender, mechanical drive section, compressed air system, lubrication system, hydraulic pressure system, basic section, reeling machine. The trimmed width of Leizhan corrugated/fluting paper machine range from 1575-5800, and its basis weight range of 60-150 g/m². It has a production capacity range of 15-500 tons per day with the operating speed range of 100-800 m/min.